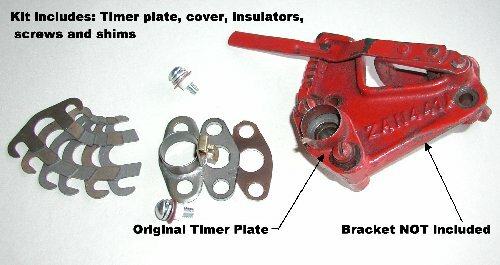 1-1/2HP Disc or dishpan flywheels, hit & miss, battery and coil ignition, no needle valves in carb. 1-1/2HP Bosch oscillating magneto with 2 3/4" or 5 1/4" trip arm, two needle carb, two styles of cam-governor bracket, gears, and camshafts. If not a replacement, cam-gov. brackets are cast iron. 2HP Disc or spoke flywheels with gear driven "R" mag or may have "RV" or "J", two needle carb, pot metal cam-gov. bracket (Often broken or missing-our replacements are aluminum). 3-6HP Bosch mag, may have diagonal or straight cogs on gears, mag uses 2 3/4" trip arm, 1919-1924. 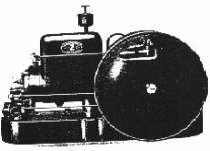 3-6HP "R", "RV", or "J" mag with pot metal cam-gov. bracket, straight cogs on gears. 5HP Style "B", most of the new parts we offer for the 3HP inter-change except for the head gasket and the piston rings (avaiable from ring list.) Cyl. bore on this engine is 4 3/4" compared to 4 1/2" for the 3HP. 7-1/2HP Style "B"-In comparing the 6HP and 7 1/2HP "B" part's book, there are a lot of subtle changes in the part #'s as if F/M was trying to make it appear as if the 7 1/2 was a completely different engine (being they upped the HP by 1 1/2), but we have found both have 5 3/4" pistons and it appears all the parts interchange. We suggest you order 6HP parts for this model. NOTE: On any of these engines you should check the width of your rings before ordering replacements as later models and replacement pistons in early models had narrower ring grooves. Gov. weights also vary (check our drawings). Serial numbers are usually found on a boss on the top of the water hopper. Confused?-Please call. HM247 Gear, Cam, 1-1/2 to 2HP call for avail. HM2473 Gear, Cam, 3-6HP call for avail.